Our British recognised international qualifications are aimed at talented students aged 18 and above from diverse backgrounds. Higher National Certificates (HNC) and Higher National Diplomas (HND) are undergraduatle level qualifications in areas of Business, Accounting, Marketing, Law and Management. Those work-related programmes reflect the requirements set by professional organisations across industry, giving our students the knowledge, skills and experience demanded by today’s employers. They are widely recognised by universities and professional bodies carrying ECTS credits. All European recognised Undergraduate courses carry 60 ECTS which ensures recognition of attainment throughout Europe and beyond. Higher Nationals provide 60 ECTS during the first year at the Certificate level and 60 ECTS during the Diploma level. Upon graduation, students will have accumulated 120 ECTS which allow them to pursue an international career worldwide, continue their further higher education on international level or proceed with specialised education at a worldwide recognised professional body such as CIMA, CIM, ACCA, CFA or others. Choice of a minimum of 8 different courses based on your specialisation e.g. 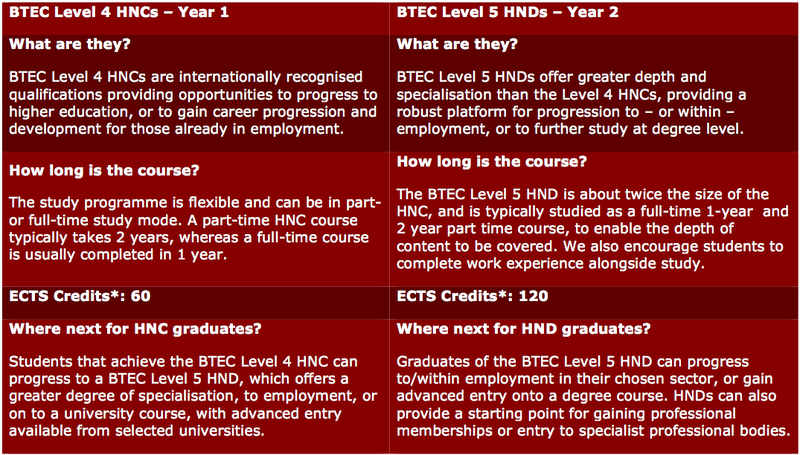 The BTEC Level 5 HND is widely recognised as equivalent to two years of university education. Everything you learn and achieve can count towards an undergraduate degree and the majority of BTEC graduates are fast-tracked to the final year of a degree course. Pearson – the provider of BTEC qualifications -works with universities to ensure that students have guaranteed progression routes in the UK, Ireland, Canada, United States and Australia. You have the option to move onto the 3rd years of the Bachelor in Economics programme with the Nobel International Fraternity Academy. Or for instance, you could then progress to the UK for your final year. Universities really value the learning experience that BTEC students get from their course: knowledge and understanding of essential theory blended with real-life, practical skills. You can research your international continuous study options by exploring the Pearson Degree Course Finder. All BTEC is recognised by employers, universities and professional bodies from across the globe, giving you recognition for your learning, wherever you travel in the future. BTEC qualifications have been mapped on to the ‘European Qualifications Framework’. This is a Europe-wide set of qualifications standards with 8-qualifications levels (from entry to doctorate level). Being mapped to the European Qualifications Framework (EQF) means that each BTEC qualification can be mapped to any other in Europe, giving BTEC holders a recognised standard within the EU and beyond. For example BTEC National Diplomas are accepted for entry in 95% of UK universities.